Companies are hurrying to develop applications for the Apple Watch following the much-touted launch of the wearable device. Being first to market allows organisations to capitalise on first-mover advantage and show they are ahead of the pack, which sends a clear signal to the market and customers that the company is an innovator. It is no surprise, therefore, that companies have jumped on the Apple Watch bandwagon, with apps for the smartwatch being released daily. Among those that have already launched apps for the Apple Watch are Ocado and Booking.com. Paul Clarke, director of technology at Ocado, says the online retailer is interested in using wearables to improve customer experience, describing it as a “waypoint on the journey, not an endpoint”, and saying the device marks a major enhancement on what came before. “We need to be on the journey to where it's going,” he adds. Being among the first app designers to figure out how to add desirable functionality to a new wearable device form-factor also demonstrates creativity and technical know-how. Stuart Frisby, principal designer at online travel company Booking.com, says the Apple Watch “pushes the envelope”. Smartwatches, like the Apple Watch, have smaller screens and are designed to be used in an entirely different context to smartphones. While someone may browse a smartphone for an entire train journey, the watch needs to be optimised for brief, intermittent activity. Ocado's director of technology, Paul Clarke, believes wearable technology is an area where fortune will favour early adopters and experimenters. “It's really important to start getting your feet wet. It will be a transformational technology and one people will not be able to opt out of,” he says. Clarke predicts the internet of things (IoT) will dwarf the mobile phone revolution. Wearables are one important aspect of this. When assessing IoT and wearable technologies he recommends CIOs and CTOs look beyond the obvious, at “how these devices can touch the lives of customers, employees, smart offices and smart factories”. Above all, Clarke urges organisations to encourage and foster experimentation. “If you wait for maturity you’ll miss the boat,” he warns. But, above all, businesses looking to develop apps for the Apple Watch need to start with principals. Clive Howard, principal practitioner analyst at Creative Intellect, recommends that companies considering developing a smartwatch app ensure the product adds value to the user. “The app designer needs to consider the functionality that can be achieved on a wearable device. If it's not unique to a wearable, then it probably doesn't need to be a wearable application,” he says. Specifically, Howard recommends that application designers consider the context of use, such as what situation the user will be in. Ocado looked at tasks customers would want to do on a watch when they couldn't use their phone, such as voice activation and status updates. One of the functions the Ocado Apple Watch app offers is instant order. “We use predictive analytics to look at historical purchasing and to learn what you want in your basket. We have a pretty good idea of what you want and, within 15 seconds, we can add the items to your basket,” says Clarke. Another app attempting to work in a wearable context is Booking.com's Booking Now for iOS. The app was released in early 2015 and has been enhanced for the Apple Watch. Booking.com’s Frisby says the Apple Watch poses unique challenges from a user interface perspective. But it is a challenge the travel bookings company has stepped up to in a bid to demonstrate innovation. This means Booking.com has tried to develop the app in a way that adds enough value without inundating the user. The user experience is based on the fact that the user will only glance momentarily at the watch face. Frisby says the information displayed needs to add value instantly, and the application must be streamlined as users want to do less. In Frisby’s experience, the Apple Watch software development kit (SDK), while limited in its richness, benefits the app developer. Can Apple’s new wearable device make it in the enterprise? IBM is training Watson, a cognitive computing system, to support healthcare apps written for the Apple Watch. Consumers may soon be bringing Apple Watches into the enterprise, and IT should seize the opportunity to boost productivity. “There are some constraints that come from the watch. If there were no limits to what I could change or make, the user would be inundated with irrelevant content and end up with battery life issues,” says Frisby. Instead, he says Booking.com’s application relies on a solid back-end system, where the iPhone does the heavy lifting, such as downloading and resizing images, which are then transferred over Bluetooth to the Apple Watch. Ocado’s Clarke admits his team needed to overcome a few challenges during development of the Ocado Apple Watch app. “We had to modify the iPhone app and put it through Apple's approval process,” he says. Among the technical issues were how to make the smartwatch and iPhone talk to one another and the design for the new watch controls, since Apple uses the watch's crown for scrolling and selection. Given the Apple Watch is connected to the iPhone, developers need to be aware of what happens if the iPhone doesn't work. “You now need to consider how to fail gracefully,” says Frisby. As smartwatches are a new device type there is little experience of how to develop apps cross-platform for Apple and Android Wear devices. Outside the mass consumer market, Apple Watch and other smartwatches could add value across industry sectors. One of the big opportunities is health, with both fitness and healthcare support applications available for users. Medopad has developed a platform and iPad application to support clinicians. Its latest product is an Apple Watch app, which is the company’s first product aimed at patients. The app is designed to be used by chemotherapy patients as a way to monitor treatment and side-effects. “The Apple Watch provides an easy way to report symptoms,” says Dan Vàhdat, CTO at Medopad. Data collected on the watch is transmitted via the iPhone to the user's doctor. With some courses of cancer treatments costing upwards of £25,000, Vàhdat says the app enables a doctor to check if the patient is taking their medication, but this is entirely reliant on the user interacting with the app. One company in the US, called Proteus Digital Health, has developed a smart pill, which transmits a signal when it is ingested. Vàhdat believes it is entirely possible for a smartwatch to be used to capture such signals, enabling doctors to track when the patient has taken the smart pill medication. Ocado’s Clarke is also looking at wearables and the internet of things (IoT) suited to the business environment. “We have looked at all kinds of devices, such as Google Glass, and built projects around them,” he says. The retailer's warehouses are highly sensored environments using machine-to-machine (M2M) communications. But the question of deploying this technology widely is one that inevitably comes down to cost. “The durability of consumer devices may not cope with the industrial environment,” says Clarke. US bank Citi is quick off the mark with a mobile app for the Apple Watch that lets customers check balances. Allied Irish Bank is developing an app for the Apple Watch to allow customers to check their balance and find the nearest cash machine. Nordea Bank promotes its digital ambitions with an app for the Apple Watch. Tesco Bank is the latest company to enable customers to access mobile banking services using an Apple Watch. 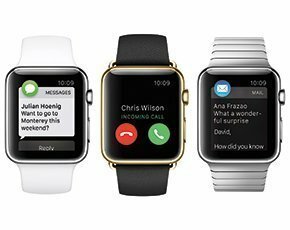 Finance software house Misys launches a prototype banking app for the Apple Watch that will be available off-the-shelf. Another problem for Ocado is battery life. The retailer runs operations 24/7, but Apple Watch battery life is stated as 18 hours. But devices in the consumer space do tend to migrate to the enterprise. “Tablets started as consumer devices. Now ruggedised tablets are commonplace in industrial environments,” says Clarke. So should a CIO or CTO embark on a smartwatch application development project? Nigel Beighton, vice-president of technology at Rackspace, who worked as CTO at Lastminute.com in the early 2000s, believes anybody not thinking about wearables is not thinking about the market properly. “Those who are in the businesses of developing mobile apps have to think about smartphones, tablets and wearables and how they work together, otherwise you aren’t going to be successful,” says Beighton. Well, of course. It's Apple, watch or otherwise. As the saying once was "you can't go wrong with IBM", it's now "Apple or die." So of course developers are tripping over themselves to deliver the next big add-on for iWatch. OTOH, I'm not sure - at least in the short term - that this wrist doodad will really set the market afire and keep it blazing long enough for profits to spread past hypochohdriacal obsessions. I wonder if it's really another iPhone or merely the wrist-top version of Google Glass. Nice, but niche. We'll see. The reasons established brands need to launch on the Apple Watch quickly may be the same reasons early-stage companies and independent developers need to hold back. Being seen as innovative isn’t typically a struggle for startups and the low-engagement experience of the Apple Watch means newer companies will have limited ability to capitalize on first-mover advantage if their customer engagement outside the app is less mature than the competition.